ANCHOR BAY ENTERTAINMENT BRINGS YOU THE BIGGEST AND BADDEST BOX SET OF THEM ALL! Beverly Hills, CA - All hail Spartacus - his legend will live on! Anchor Bay Entertainment releases every season of the acclaimed Starz Original series in a complete muscular thirteen-disc Blu-ray(TM) + Digital HD with Ultraviolet(TM) and DVD box set on September 16th. From executive producers Rob Tapert, Sam Raimi, Josh Donen and Steven S. DeKnight, here is every moment - uncut and uncensored - of the series that broke all the rules and took no prisoners! Spartacus: The Complete Collection is a beautifully packaged collection that contains a full disc of new bonus features. The Blu-ray(TM) + Digital HD with Ultraviolet(TM) edition contains three new audio commentaries for the first season that are exclusive to this collection. A limited edition Blu-ray(TM) + Digital HD with Ultraviolet(TM) set packaged with a Spartacus collector's figurine will also be available with an SRP of $199.99. SRP is $149.99 for the Blu-ray(TM) + Digital HD with Ultraviolet(TM) and $119.98 for the DVD. Pre-book is August 13th. 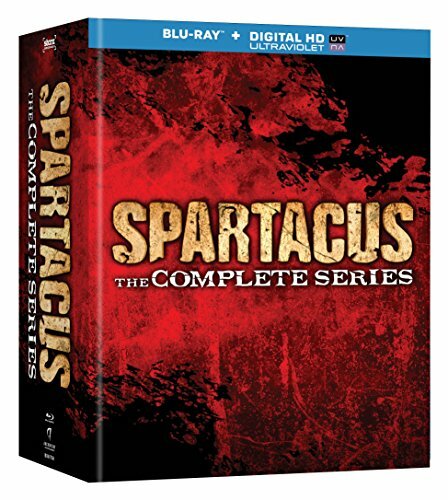 Spartacus: The Complete Collection is the classic tale of Spartacus, the Republic's most infamous rebel who comes alive in the first season of "Spartacus: Blood and Sand." Then comes "Spartacus: Gods of the Arena," the prequel that explores a deadly history before the arrival of Spartacus, and the death he now carries with him. The second season, "Spartacus: Vengeance," continues to follow Spartacus as he is faced with a choice to either satisfy his personal need for vengeance, or make the sacrifices necessary to keep his growing army from breaking apart at the seams. Finally, in "Spartacus: War of the Damned," Spartacus will carve his name into history as he plots to avenge his wife's death and leads Batiatus' slaves in a bloody uprising that will not be forgotten or equaled. "The gods finally bless us with the complete collection," says creator and executive producer Steven S. DeKnight. "Spartacus was a true labor of love for everyone who worked on it and I'm incredibly proud to present all 39 episodes in stunning High-def for the fans to enjoy at their leisure, but make sure you watch them in the order they first aired to revel in the experience as originally intended." Spartacus: The Complete Collection features Andy Whitfield in a star-making turn in the title role for season one, Liam McIntyre takes over as Spartacus for season two and three. Also featured in memorable roles are John Hannah (The Mummy, Four Weddings and A Funeral), Peter Mensah (300, The Incredible Hulk), Manu Bennett (30 Days of Night), Nick E. Tarabay ("Crash"), Dustin Clare ("Underbelly"), Dan Feuerriegel ("Home and Away"), Simon Merrells (The Wolfman), Todd Lasance ("Cloudstreet"), Cynthia Addai-Robinson ("FlashForward") and Lucy Lawless ("Xena: Warrior Princess," "Parks and Recreation"). This is what fans have been waiting for, the full Spartacus in one big, bold and bloody box set. Spartacus: The Complete Collection is the one to own - it's as powerful and compelling as the name it carries. Starz Networks is a leading provider of premium subscription video programming through the flagship STARZ(R) and ENCORE(R) pay TV networks which showcase premium original programming and movies to U.S. multichannel video distributors, including cable operators, satellite television providers, and telecommunications companies. As of March 31, 2014, STARZ and ENCORE serve a combined 56.3 million subscribers, including 21.9 million at STARZ, and 34.4 million at ENCORE, making them the largest pair of premium flagship channels in the U.S. STARZ(R) and ENCORE(R), along with Starz Networks' third network MOVIEPLEX(R), air over 1,000 movies monthly across 17 linear networks, complemented by On Demand and authenticated online offerings through STARZ PLAY, ENCORE PLAY, and MOVIEPLEX PLAY. Starz Distribution develops, produces and acquires entertainment content, distributing it to consumers globally on DVD, digital formats and traditional television. Starz Distribution's home video, digital media and worldwide distribution business units distribute original programming content produced by Starz, as well as entertainment content for itself and third parties. Starz Animation produces animated TV and movie content for studios, networks, distributors and audiences worldwide.